SCRATCH SUPPER: PASTA WITH SUMMER SQUASHES, WALNUTS, AND PESTO | Jane Lear. Writing on Food and Travel. Hey, I don’t have much time this week, but I have to share this crate of zucchini and crookneck yellow summer squash with you because it made me laugh. The zucchini are fat, glossy, and complacent—one might think they’re well aware of their come-hither appeal. The crooknecks, on the other hand, look like they want to make a break for it. Warty, irregular, and somehow yearning, they know they’re not for everybody. They’re as thin-skinned and tender as zucchini (which are actually a subset of summer squash), though, and very flavorful. I just love them. I’m grateful I succumbed to the charms of both, for they were the foundation for a scratch supper yesterday evening, cobbled together for a pal who came into town unexpectedly. Having pesto—my go-to condiment this time of year—in the fridge was key; I generally hew to Marcella Hazan’s version. I spent all last night thinking I’d created something sublime, but at heart I know perfectly well I am not an original cook. Late this morning, the color linocuts hanging on the wall of Susan Friedland, cookbook editor extraordinaire and all-around force of nature, jogged my memory, and I remembered where I’d first had this combination—Chez Panisse, Alice Waters’s landmark restaurant in Berkeley, California. The recipe appears in Chez Panisse Vegetables, and it is so intuitive, no wonder I thought I’d made it up. I didn’t use fresh pasta, but rather dried egg fettuccine, and I could have exactly the same thing for supper again tomorrow evening. Sounds like a plan. 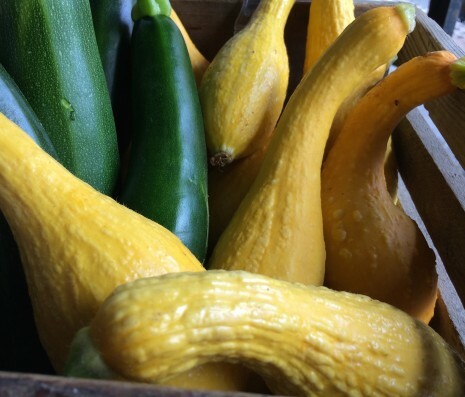 Trim and julienne some zucchini or other summer squashes and sauté in olive oil until tender and starting to brown. Season with salt and pepper. Cook fresh noodles and add to the pan with a ladle of the pasta water or some chicken stock; some toasted walnuts, roughly chopped; and pesto sauce. Turn off the heat and toss well, taste for seasoning, and serve with grated Parmesan.